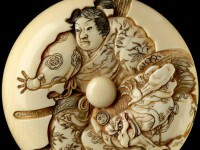 Discover dramatic episodes from Japanese culture in these exquisitely carved objects and prints. 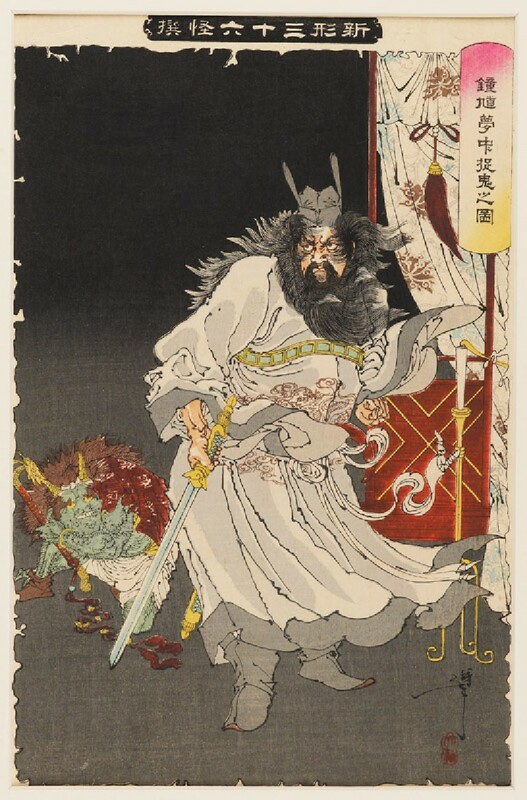 Shōki is known as the Demon Queller. This name arose from a story involving the eighth-century Chinese Emperor Xuanzong who, troubled by demons, had become sick. Shōki appeared to him in a dream and demonstrated that he could quell the demons. He explained to the emperor that after failing his civil examinations he had committed suicide in shame. His way of helping the nation was to rid it of these malicious creatures. The Emperor was so relieved that he recovered and restored Shōki’s honour with a full ceremonial burial. Shōki is also depicted on the netsuke EA2001.90. The netsuke is a form of toggle that was used to secure personal items suspended on cords from the kimono sash. These items included purses, medicine cases or tobacco paraphernalia.